Mixing, stirring, cooking and sterilising are basic operations in food production and processing and sometimes require special adaptation of the equipment to the raw materials and the process. These machines, with their conical construction and rotating mixing screw, have proven particularly useful for processing natural products such as coffee beans, cocoa nibs, gluten or nuts such as chestnuts. can be integrated into the processing equipment, thus saving further investment. The customised machine configuration ensures an optimised process. 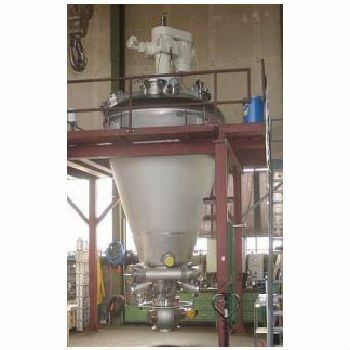 Initial product and solid or liquid ingredients are filled into the conical screw cooker mainly by gravity and may be homogenised prior to the heat treatment process. For sterilisation or heat treatment steam may be flushed into the conical cooker under pressure and high temperature to heat and sterilise the batch and/or to extract certain ingredients. This may be assisted by a heated jacket, protected against heat loss and for safety reason by an overall insulation jacket. Condensed liquid could be drained and an initial drying process could be maintained by applying vacuum to the heated process cooker. When the heat treatment process is finished, the product and the equipment may be cooled down to an acceptable discharge temperature by cooling the jacket or by pulling vacuum using the evaporation energy to cool the batch. The final product is discharged via the bottom discharge valve into a bin, container or conveying system by gravity, assisted by agitation of the screw and arm without leaving residues at a high yield. For cleaning the equipment internals between individual batches, or before product change, fix welded spray nozzles will spray cleaning fluid to the entire inner cooker surfaces. All product exposed or contaminated parts are wetted, washed down and rinsed with cleaning liquid or water. This guaranties an efficient total cleaning of the fully contained cooker internals. Gentle processing of the raw materials is ensured at all times by the slowly rotating mixing screw, which is guided along the wall of the vessel, thus ensuring optimal mixing. The heat transfer coefficient is high and the risk of thermal damage to the products is low. Complete discharge and easy cleaning are important processing advantages of the conical shape. The entire process takes place within a closed system and can therefore be kept sanitary and even sterile - the product is protected at all times.